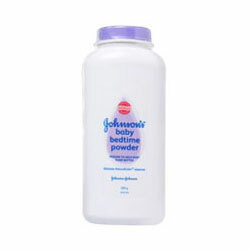 Buy Johnson's Baby Bedtime Powder. Keep Baby's Skin Soft, Smooth & Comfortably Dry..
Johnson's created a nightly routine clinically proven to help your baby fall asleep easier and sleep through the night better. Following a warm bath using Johnson's Baby Bedtime Bath gently massage baby's skin with Johnson's Baby Bedtime Lotion, use Johnson's Baby Bedtime Powder to keep baby's skin soft, smooth and comfortably dry. Each product release NaturalCalm, a proprietary blend of soothing aromas and delicate essence of Jasmine Blossoms. This will help your baby wind down to promote a better night sleep. Clinically proven mild and allergy tested. Helps keep baby's skin naturally soft. Sprinkle powder onto your hands before applying to baby skin. Close tightly after use.